The jail was inadvertently sold to Robert Pinckney, 16, in a delinquent tax sale in 1943. When the city refused to buy back the jail, sparking a legal battle that earned national publicity, Pinckney put the jail up for auction at a West Coast war bond drive. Charlie McCarthy, ventriloquist Edgar Bergen's puppet, "bought" the jail for $10,000 in war bonds and deeded it back to Harvard. Estimated to be over 130 years old, the jail was refurbished in 2008-10. 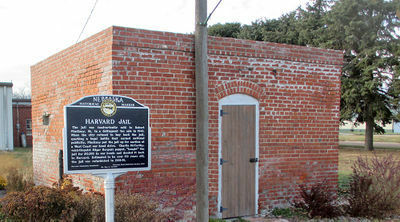 “Harvard Jail,” Explore Nebraska History, accessed April 19, 2019, https://mynehistory.com/items/show/80.